This is a question we often get from customers. What type of dirt do I plant my waterlilies and bog plants in? You’ll probably get several different answers from different sources. The main thing plants need from the soil is moisture retention, anchorage and fertilization. The soil helps keep the plants upright, holds the moisture that they need to flourish and holds the nutrients that it needs to grow and bloom. I often tell customers if you have a place in your garden to dig dirt up this works great as long as there aren’t fertilizers in it. Clay Garden Soil – Water plants grow best in a clay based soil. A higher amount of clay is good for it. It holds nutrients and water for the plant to absorb and keeps the plants upright. It is messy and dirty, but you can always clean your hands afterwards. 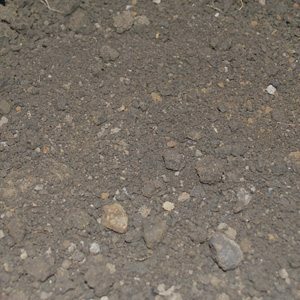 Sandy Garden Soil – Sandy soil or even pure sand is ideal for many of the bog plants that are mounded or creeping. It doesn’t hold some nutrients like clay soil does but will work with smaller bog plants. Just remember with sand you have to fertilize alot because it doesn’t hold fertilizer as well as clay based soil. Cat Litter – This is something used quite often for pond plants, especially water lilies. Make sure you purchase the type that says “calcified clay” on the package. You can’t use shredded paper or the type that has been chemically treated or deodorized. Calcified clay has been taken from the ground and cleaned, baked and pulverized. It has the same nutrients and moisture-retention as that of clay soil and won’t float to the top of your pond. Once it is put into your pond it will harden and appear the same as clay soil. Potting Soil or Garden Soil – This is something that you DON’T want to use. These are usually easy to find in your store labeled as potting soil and garden soil but contain a high degree of organic matter like peat moss and manure. It will only rot and decay once it gets wet and breaks down quickly. Great for pots out of the pond or planted in your flower garden. If put in a water garden it will float to the top of the water. Once you have your plants planted you will want to put a topping on it. This helps prevent fish from digging the soil out of the pot and helps to reduce the amount of weeds that can grow in the soil. The best to use is pea gravel. If you have fish, especially Koi, the larger stones work better. It keeps the fish from sucking them out of the pot. Sand is also sometimes used, but I would suggest using it only for submerged plants, oxygenating and tropical lilies. It’s softer than pea gravel and lessens the possibility of damaging the crown of the lily. If you use dark colored gravel or sand it will make your plants appear greener where light colors often tend to make the plant look yellow. OK I have now made my first error and planted over 13 plants with potting soil and topped with rocks..I don’t know if I have the time to replant, it took two full days. I managed to get all the debris on the top of the water out. However I now have dirty (tea looking) water. I added some horticulture charcoal to my filter and pump…what now ? any ideas would be appreciated. Thanks for your time. Potting soil will make a mess in your pond. You did right by adding charcoal to your filter. This will help clear your water, much like an charcoal filter in an aquarium. I put charcoal in my skimmer box every year as it helps keep the water clear. It will take a few days but your water will clear again. The best type of soil is the regular dirt you dig up in your garden, clay dirt. If you don’t have that available use kitty liter and sand. Make sure the kitty liter is the type that says “calcified clay” on the package. You can’t use shredded paper or the type that has been chemically treated or deodorized. Hope your pond clears up quickly for you. I made a mix of 5 parts sand, 4 parts clay cat litter and 1 part garden compost as indicated in a book I have. Turns out that I used a clay litter with deodorant not what you suggested. What will happen? I would try and get as much as I could out of your pond. You want to make sure you use a cat litter with no deordorizers in it. I’m not certain how it will affect your pond, all I know is all the literature I’ve read only says it could harm your pond but doesn’t say exactly what will happen. Stupid question. Can I use 100% red clay? From what I read, clay is the best. Just wanting to make sure before I do this! !